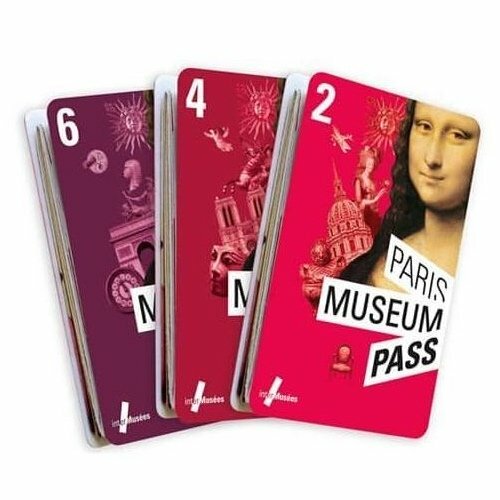 In a city that boasts over 140 museums and also has a food culture worth traveling across the Atlantic for, you just know there are going to be cafes and tearooms in certain Paris museums that are as worth visiting as the museums themselves. Over the years we've become loyal fans of these culinary gems found in some of the most romantic and glorious museums of Paris. 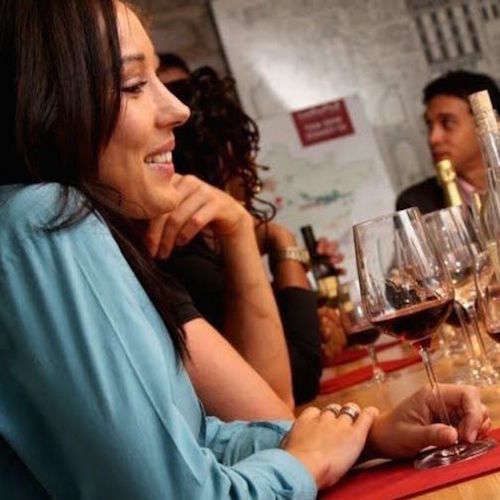 We've already told you about the best places to eat at the Louvre and where to eat at Musée d'Orsay, so let's now take a look at the culinary secrets of some smaller museums in Paris, including Musée Jacquemart André and Musée Maillol. Let's head out for a museum meal, knowing you won't have to travel beyond the gift shop to find something truly good. Here are our favorite cafes, restaurants, and tearooms worth a detour. It's hard to believe the the Maillol Museum cafe was once a cabaret. In 1951, brothers Jacques and Pierre Prévert opened a cabaret here — the Fontaine des Quatre-Saisons — before it was a museum dedicated to French sculptor Aristide Maillol. 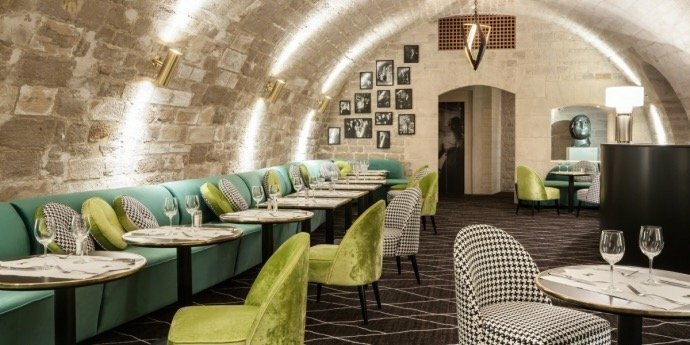 In the 1990s Maillol's artistic muse, Dina Vierny, with the help of architect Pierre Devinoy, renovated the lower level, highlighting the vaulted ceilings and added sleek banquettes and chic furniture. The menu features salads named after famous artists like the Gauguin — a melange of spinach, chicken breast, snap peas, ginger, coriander & mint— and the Matisse, with feta, sundried tomatoes, cherry tomatoes & tapenade. There are also main courses, tea service, pastries, hot drinks, and chilled Roederer champagne by the glass. There has always been a cafe at the Jeu de Paume and now Hana Bento adds an Asian twist with a pleasing Japanese decor and cuisine to match. On the menu is bento, udon, and nigiri along with teas imported directly from Kyoto. The cherry on the top is the stunning terrace open during the summer that overlooks the large pond of Jardins des Tuileries. And Paris being the City of Desserts, there's also a good selection of patisseries, cheese cakes, financiers, and Asian-inspired concoctions. 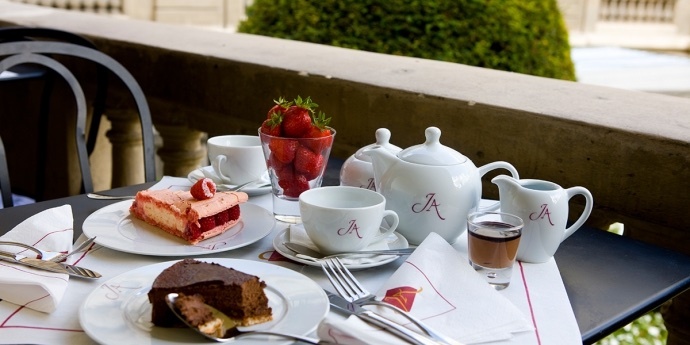 Located in the splendid former dining room of the mansion, Café Jacquemart-André is the one of the most beautiful tea rooms — and best kept secrets — in Paris. Although the museum is located on busy Boulevard Haussmann, you'll feel like royalty as you sip tea and sample pastries prepared at the best patisseries in Paris – Pâtisserie Stohrer and Michel Fenet's Petite Marquise. For lunch you can order salads, quiches, or the daily special before you indulge on ice cream and those great desserts. There are pretty salads named after famous artists and filled with seasonal ingredients — the Nelie (named after the museum's founder) is a blend of French beans, zucchini, cherry tomatoes, beetroots & chervil; the Botticelli is a tangle of angel hair pasta with prawns, Chinese cabbage and toasted sesame seeds. A secret garden in the middle of Paris. Just for the setting alone, this is probably our favorite museum eatery. 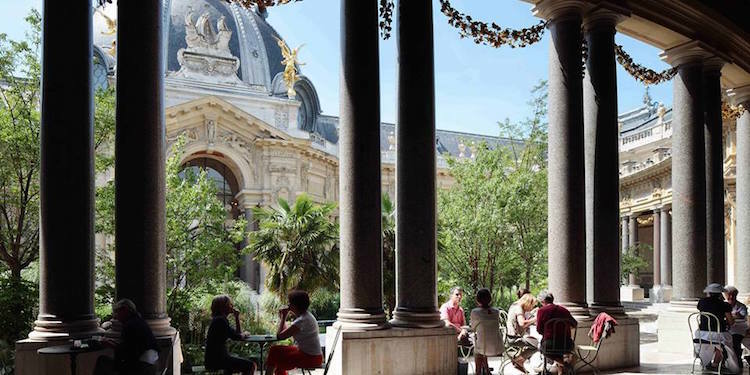 Relax in the interior garden of the Petit Palais — surrounded by swaying palm trees, banana trees, and ornamental grasses. The cafe overlooks three decorative pools, bordered with blue and gold mosaics, colonnades, and exotic plants. It's a revelation to learn that the museum and the garden debuted during the 1900 World's Fair. In fact, the colorful mosaics at the Petit Palais cafe were created by the Italian mosaic artist Giandomenico Facchina (1826-1923). He also helped to restore St Mark's Basilica in Venice and his mosaic work can be found in many iconic Parisian locations including Paris department stores Printemps and Le Bon Marché, and even Palais Garnier. On the menu — breakfast, lunch, and tea time with pastries from Lenôtre, salads, sandwiches, and savoury and sweet tarts. 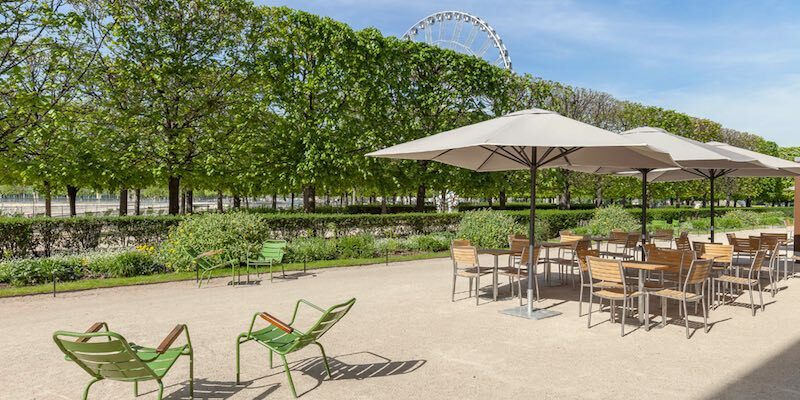 Added bonus — as this is managed by the City Paris, you have free access to the museum, garden, and cafe. 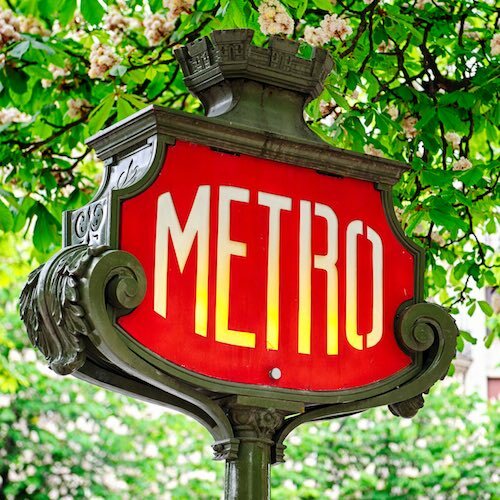 Cross the street from the hidden garden cafe at Petit Palais to arrive at opposite world — the Grand Palais' MiniPalais. The cafe menu, managed by 3-Star Michelin Chef Eric Frechon of hotel Le Bristol, has been gathering a loyal fan club. It's a restaurant, it's a cocktail lounge, it features a vast 3,200 square-foot outdoor veranda lined with palm trees. With Chef Frechon in charge of the menu, you know it's going to be good. The cod perfumed with coriander and lemongrass, tandoori with red onion relish, and giant baba au rhums keep Parisians coming back for more. And in case you've been living under a rock, you'll know that cocktails have stormed Paris in the past decade. The cocktail bar at MiniPalais features drinks like the Captain Hook, made with rum infused with raisins, pineapple syrup, lime and passion fruit. We're fond of the the Green Bay, a blend of Bombay gin, Chartreuse, lime, basil, and ginger beer.